In the wake of the London attack many people have been quick to praise the bravery of the city's "heroes" - the emergency services and members of the public who rushed to help those in need. Doctors and nurses were seen running from nearby St Thomas' Hospital to help those injured on Westminster Bridge while MP Tobias Ellwood was pictured giving mouth-to-mouth resuscitation to PC Keith Palmer, the officer stabbed by the attacker. Another of those quickly on the scene outside Parliament was Dr Jeeves Wijesuriya, chairman of the junior doctors' committee at the British Medical Association, who had been talking to a regional BBC team when the events began to unfold. "I saw the screaming and ran to help," he said. "The police got me in to help at the scene. We gave the officer cardiac massage and spent 52 minutes trying to resuscitate the other man. "We did everything we could, in terms of basic life support and starting to triage injured people at the scene." Tony Davis from Gateshead was also among the group who came to PC Palmer's aid. The Team GB boxing coach and Army veteran had been at the Houses of Parliament for a press event with a group of boxers when he saw "a large chap brandishing two knives come through the gates and start attacking the policeman". "I had my phone out to take footage for social media about the event. I didn't realise there was a crash then at the time, I thought it was a student demonstration, there were people running, coming round towards the gate," he told ITV's This Morning. "At that point instinct kicked in, I leaped over the fence because that guy needed assistance... I'm not that specially trained in first aid but I know the basics and can put someone at ease. I put my raincoat underneath to try to stem the blood," Mr Davis added. "I've obviously reviewed the footage and audio on my phone which I've given to the police. About 90 seconds into it another guy called Mike came and joined in and at this time there were lots of police around, Keith's colleagues. Three and a half minutes was when the MP came in and sort of took over CPR." "The MP did a tremendous job, everyone there did. I can't commend the air doctor enough. Very professional, very thorough. It was a great show of solidarity. "I'm not brave, I'm not a hero." Praise for the police and NHS staff poured in on social media with people posting messages of solidarity and using the hashtag #WeAreNotAfraid. Dr Tony Joy, one of the London Ambulance team that landed in Parliament Square, said it had been "an awful day and a long night" but "it's a privilege to do the job". 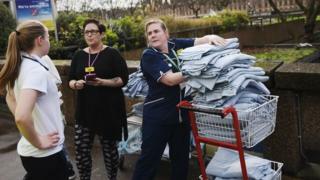 Anna Crossley, from the Royal College of Nursing, said she had been speaking to some of the nurses at St Thomas' Hospital since the attack took place. Ms Crossley, who has worked in Afghanistan, said: "I think instinct just kicked in for those who rushed on to the bridge to help. For many a natural reaction would be to run away but for health professions they know they need to help. "In these sorts of situations your training really helps. You know what you have to do. It was a matter of working out who was most in need of medical help and doing what you can. "There would have been a gold commander in charge of all the emergency services. But for the nurses and doctors who were there first they would have had to make quick decisions." She said management at St Thomas' called extra staff in to help care for the casualties and had been inundated with offers of help to such an extent they then had to stop others coming in. "The response of the NHS in situations like this is fantastic," she added. Political campaigner Richard Tice, who witnessed the attack and its aftermath, said the way people on Westminster Bridge helped the injured showed the character of the city. "The whole length of the bridge there were passers-by tending to the injured before the medics arrived. That's the spirit of London. "I'm sure that would happen in any city. But that is the bravery and care one human has for another." Brendan Cox, the widower of MP Jo Cox who was murdered last year, said the attack was a story about "the people that didn't come home yesterday". He told BBC Radio 4's Today programme: "What helped me in the weeks after (Jo's death) was that sense of public support. Those thousand acts of kindness. "One of the things we need to be careful about is giving notoriety to the person that did it. "I would much rather remember the heroes of this story." Londoners and visitors to the city were encouraged to greet any police officers they saw patrolling the capital on Thursday. "If you see our members across London today please say hello and spare them a smile. #PoliceFamily #JobLikeNoOther", The Metropolitan Police Federation tweeted. Mayor Sadiq Khan said a candlelight vigil to remember those killed, injured and affected by the attack would be held in Trafalgar Square, not far from where the events happened, on Thursday evening. His office said: "The Mayor invites all Londoners - and everyone visiting our city - to come together in solidarity to remember those who have lost their lives, to express sympathy with their families and loved ones and to show the world that we are more committed than ever to the values that we hold dear - that we remain united and open. "London is the greatest city in the world. We will never be cowed by terrorism. We stand together in the face of those who seek to harm us and destroy our way of life. We always have and we always will."